(L) Womens 1970's Super Patriotic AMERICA Shirt! Red White and Blue! Comes with SOCKS! 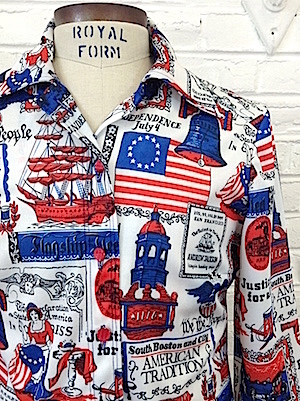 Home > Womens Vintage Clothing > (L) Womens 1970's Super Patriotic AMERICA Shirt! Red White and Blue! Comes with SOCKS! (L) Womens 1970's Super Patriotic AMERICA Shirt! Red White and Blue! Comes with SOCKS! 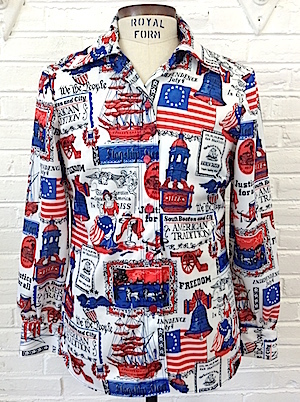 AMAZING Women's 1970's Super Patriotic AMERICA shirt! This is a women's shirt that would look fantastic on a man as well! Red, White and Blue all over with various pictures from the glory days of the American Revolution. Pictures include Betsy Ross making the flag, A cannon with the words American Tradition, the Liberty Bell, A majestic boat, and anything else you need to get your blood pumping for the forth of July. And if thats not enough, it comes with American Flag SOCKS!! Wear your freedom, show your pride!! Six red plastic buttons down the front with two more on each sleeve. Straight hem with long, pointy disco collar. No material tag, but feels like Polyester.